Happy days are here again as I have remounted my iBike Dash with Power. Props to the good folks at iBike who repaired a broken enclosure bracket on my iBike Dash device and a broken LCD screen on my iBike Gen III device – for free, even though my Gen III was out of warranty. Those of you who know me well (or even partially well), know that I’m pretty much obsessed with topographical maps, bike riding, and analyzing bike ride data — especially climbing related data. The screenshot above is from my commute home from work. The iBike Dash clearly has the best in-ride graphical user interface of all bike computers/GPS devices — making full use of the color iPhone touch screen (see this post for screenshots – https://toonecycling.wordpress.com/2011/04/21/equipment-update-ibike-dash-power-meter-wheels-and-tires-galore/). 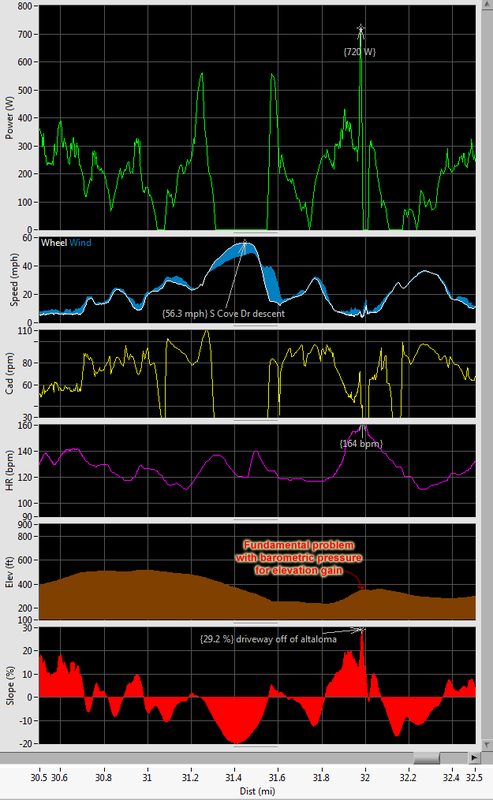 But the best two features of the iBike for me are the internal gyrometer for measuring slope and the iBike ride analysis software, which in my opinion, is the best graphing software for displaying power, cadence, elevation, heartrate, and slope all on one screen. The slope is obtained using an internal gyrometer, which is much more accurate than a barometric obtained gradient as the barometer can never catch up with the slope changes in a severely rolling area (such as where I live). About the journal article I am going to write, look at the complete iBike stats below, particularly note the “Climbing” amount. The iBike only registers 4000′ of climbing, whereas the Garmin registered nearly 5700′. 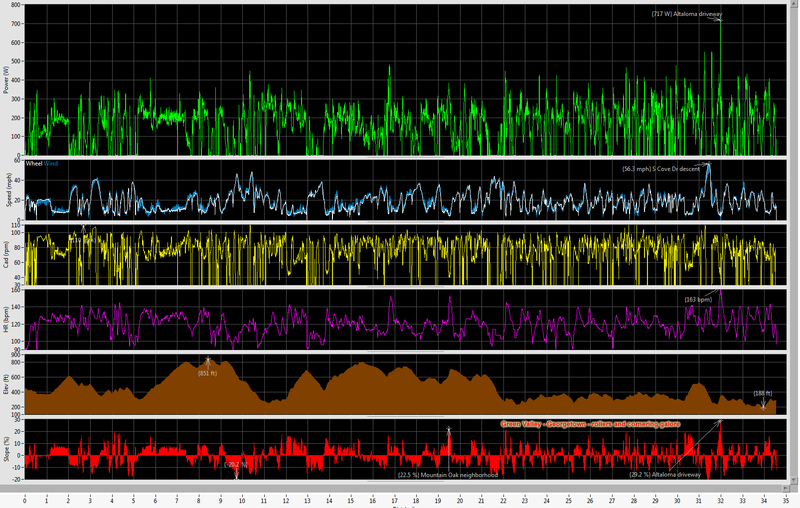 The zoomed in iBike graph below the stats shows why. Even with a 29% gradient climbing at least 30 feet, the barometric sensor only registered a 2 foot climb for the entire driveway since I turned around and immediately skidded my way back down the driveway across the road and into the grass on the other side (I can’t imagine the wear and tear on the brakes of whoever lives in that house). Even the iBike gyrometer couldn’t turn around fast enough from the extreme climb to the extreme descent with it only registering a 2 or 3% descent even though it should have been -29%. 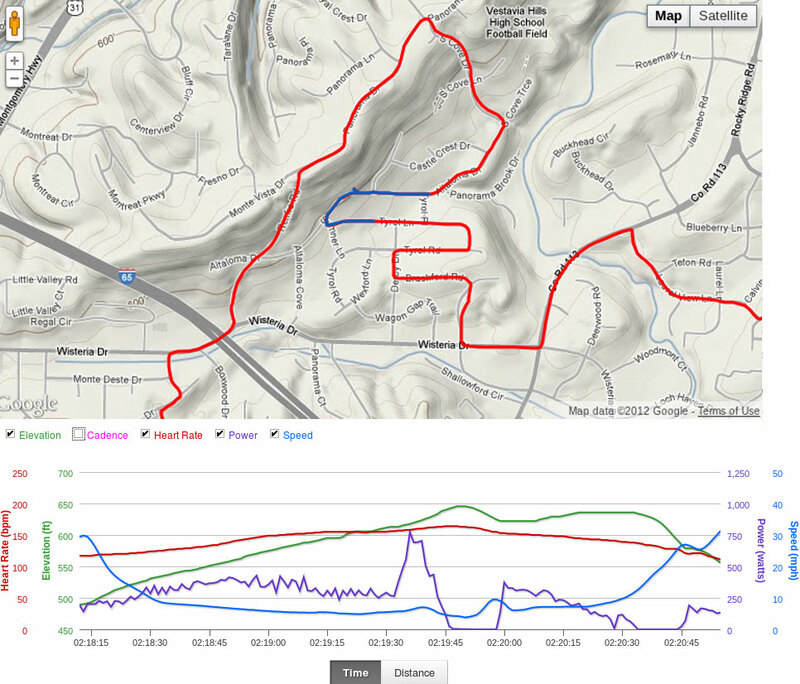 Interestingly, the Garmin registered 30 feet of climbing for the driveway and 25 feet of descending even though I noticed that the % gradient was pegged at +17% the whole way down the driveway. I guess the % display only updates itself at a slower rate than the internal elevation recording. Zoomed in S Cove Dr descent (56mph) plus Altaloma driveway climb (29%) – click to enlarge. Demonstrates fundamental problem with barometric pressure sensors for altitude measurements in constantly changing terrain. This entry was posted in Training and tagged ibike, research on February 10, 2012 by kartoone.